Pope Francis is once again urging the world to continue efforts to fight climate change. 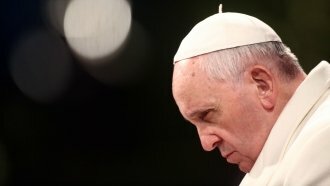 During a speech to diplomats Monday, Francis said, "There is a need to take up, in a united effort, the responsibility of leaving to coming generations a more beautiful and livable world." The pope has made it very clear where he stands on the issue of global warming. Back in 2015, he issued a scathing encyclical on the issue that connected the mistreatment of the environment to mistreatment of the poor. And just last month, he urged people to understand the "necessity to implement decisions that are truly effective in contrasting climate change."